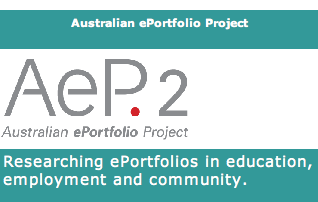 The project goals were to examine the current state of ePortfolios in the Higher Edcucation Sector in Austrailia and internationally, position Austrailia on the international ePortfolio scence and develop a resources and the establishment of a nation-wide community of practice. Stage 2: The aims of the second stage of the Australian ePortfolio Project were to focus on building the Australian community of practice through an online forum and through further ePortfolio symposium activities. The report documents the different stages of the research project, including the AeP2 symposium, the ePortfolio Practice Group on the ALTC Exchange and the AeP Toolkit.